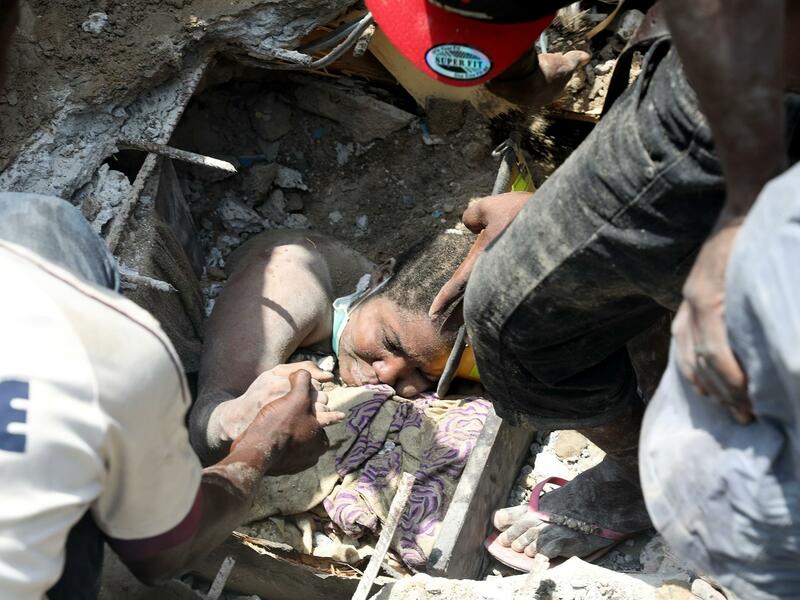 Search and rescue workers are trying to pull a girl out from under piles of concrete rubble after the collapse of a three-story building in Lagos Island, Nigeria, on Wednesday. The three-story commercial and residential building, which housed an illegal nursery and primary school, crumpled into a pile of concrete slabs and dust just after 10 a.m. local time. Students were already attending class on the top floors of the structure and more than 100 children are believed to be enrolled in the school, the Associated Press reported. The Lagos State Emergency Management Agency confirmed on Twitter four adults, five teenagers and one young boy are among those rescued. "I am not in a position to give the number of dead," Shina Tiamiyu, general manager of the Lagos State Emergency Management Agency, told AP. Images from the scene on social media show rescue workers and volunteers frantically looking for survivors amid the destruction. Onlookers erupted into cheers as a handful of terrified-looking children, covered in dust, were pulled from the rubble and carried to a waiting ambulance. One video, captured shortly after the collapse, shows dozens of wailing men and women rushing to the site. Rescue workers and volunteers search for survivors amid the rubble of a collapsed building in Lagos Island, Nigeria. - Video : Parents trooping in to the Collapsed 3- storey building at itafaji, Lagos island in search of their kids. "We just heard 'wham' and the three-story building was reduced to rubble," Fashanu Kudos, a man who lives in a house overlooking the collapsed building told The New York Times. Building collapses are not uncommon in Lagos, Nigeria's most populous city and commercial capital, where developers often circumvent building codes and use subpar materials. Most buildings here "are said not to be in very good condition," Sam Olukoya, a Nigeria-based freelance journalist told NPR's Ofeibea Quist-Arcton. "Also many of these buildings are not well constructed. They never met safety regulations. And the government has, over the years, warned people that they have to comply with safety regulations," Olukoya added. A study produced by Nigeria's Federal Ministry of Power, Works and Housing concluded 54 buildings collapsed across the country within a period of four years, news outlet The Punch reported. In 2016, a church that was still under construction collapsed in Uyo, after building was rushed to meet a deadline. Accounts of the death toll varied greatly — local hospitals estimated 160 people died but state police put the figure at 27. Lagos State Governor, Akinwunmi Ambode arrived at the scene in the Ita Faji neighborhood on Wednesday afternoon, explaining that "buildings in the area were undergoing integrity testing," Africanews.com reported. Lagos Building Officials told the BBC the building had been identified as "distressed" and listed for demolition. Ambode urged residents to allow rescue agencies to do their work effectively.